Hello everyone! It has been a few weeks since the last post, sorry about that. We have been in the middle of some big changes as previously talked about in the last blog. The bathroom has begun a complete replacement, along with renovation of 3 of the larger bedrooms. We have moved out for a few weeks while our contractor Mosaic, out of Frederick, MD, works diligently on our beautiful old house. Before I talk about what is being done, I want to say to all of you that live in or appreciate old houses and antiques, that leaving the place for an extended amount of time was very hard. We have dedicated our energy, resources, and love to this house for the last 3 years, and are extremely attached to it. Old homes have a personality of their own that a newer building can’t offer. The history and the people that have come before us live on through these structures, and we feel protective over “our history”. The contractor was very gracious when I stressed more than once to take the utmost care with her, and her contents. The house has been on the state register of historic properties since 1978, and by the end of the year will be on the National Register as well. This distinction allows us to make sure that even after we are gone the property has some level of protection. 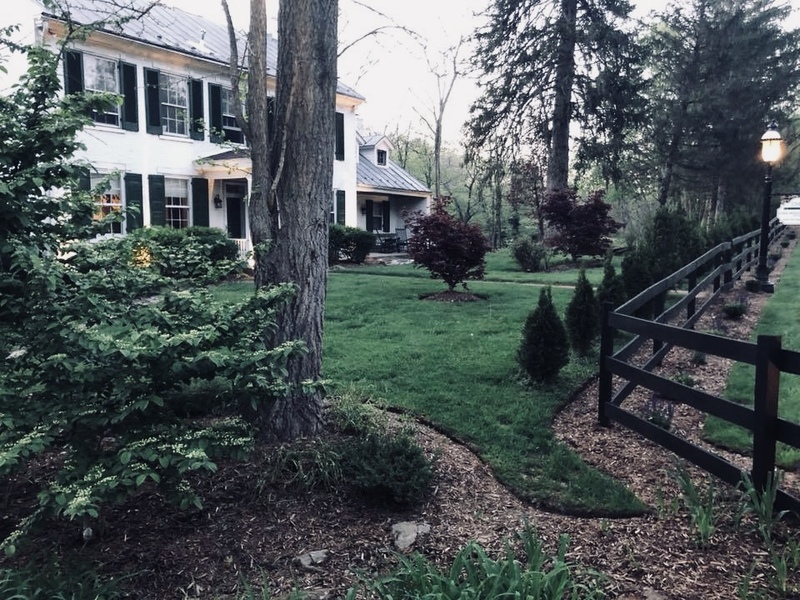 Another great thing about this being listed on the National Registry is that many states offer different tax credits and other incentives to help owners maintain their historic house. 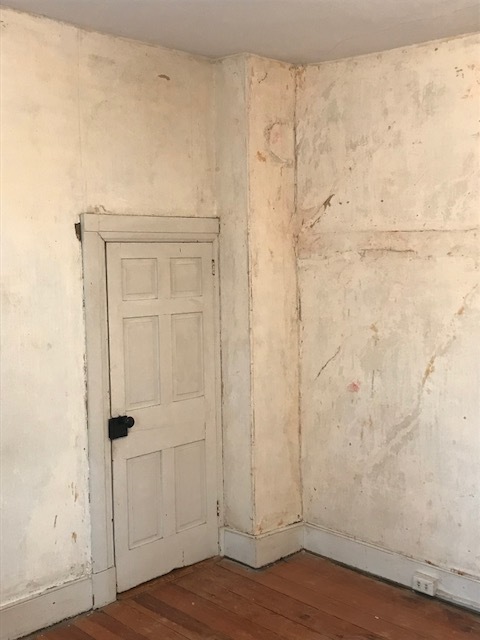 Maryland offers numerous financial assistance programs for those wishing to restore historic properties, including a credit of 20% of the cost of approved restoration projects. 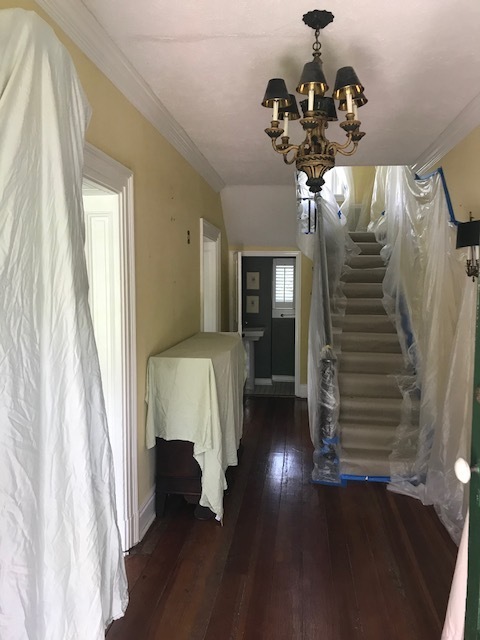 The credit requests go through a process of approval with the Maryland Historic Trust where it gets closely reviewed by preservationists to make sure all work is in line with the Secretary of the Interior’s Standards for the treatment of historic properties. We are lucky to live in a state that values its history so much and the people at the Maryland Historic Trust have been very helpful and kind. I encourage anyone who owns a residential or commercial historic property to look into different state incentives that you may be eligible for. The bathroom was a mish-mash of styles, none of which fit remotely with the house, or provided any sort of comforts. Even more important, the fixtures, flooring, finishes, and heating unit had all begun to fail. Most serious was the water damage around the toilet from years of neglect. The contractor will have to seriously reinforce this area. I had stated before that the house was constructed with the best materials possible at the time, and due to such forethought, was able to withstand a multitude of abuses. 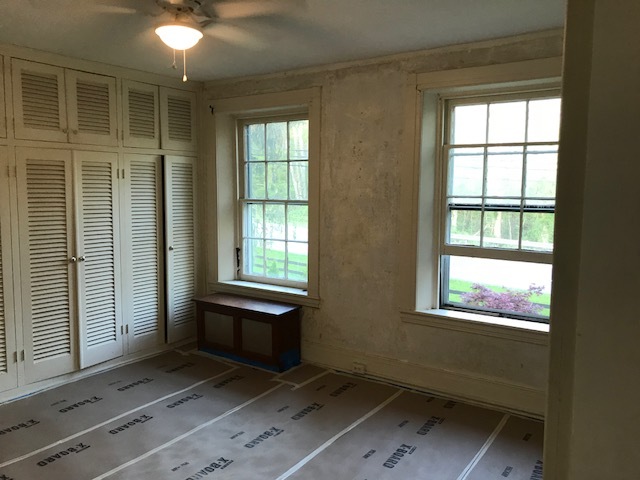 With only the molding (in places) and original window that remained of the original fabric, we were able to design a bathroom that while keeping the layout, was able to bring the room to a comfortable and usable space for a contemporary family that respects the past. The bedrooms will receive a very thin layer of ¼” drywall over the old, damaged plaster ceilings. 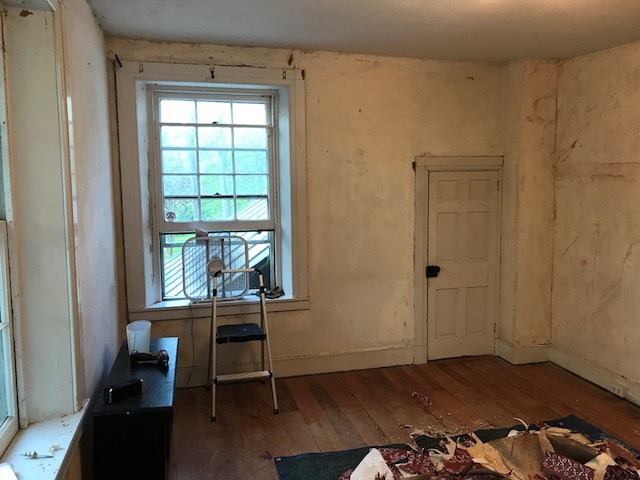 The 200 year old ceilings had been covered with a stucco type finish several times to hide the cracks and other damage. The settling of the house continues to wreak havoc on the ceilings, and it was not financially feasible to restore them over and over every year or so. The walls will receive high quality wall covering that will mask the damage on them. 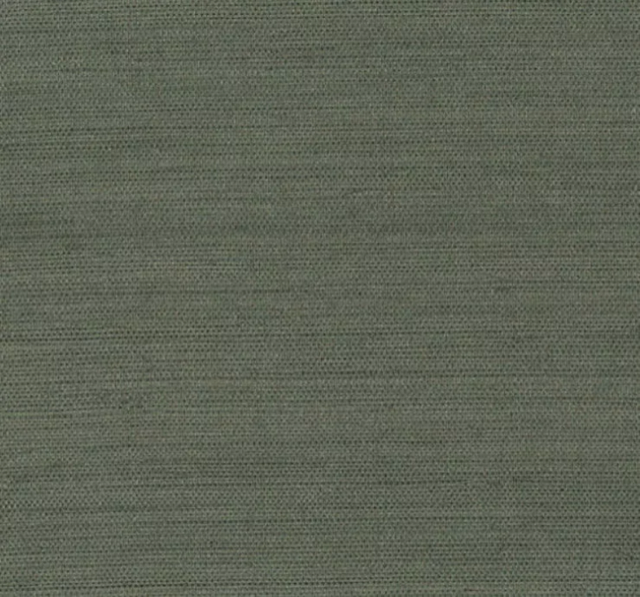 We chose coverings by Cole & Son from England because of the very high quality and historic patterns. Below are a few images that inspired us for the bath and bedrooms, and the actual wallpaper that we are using. Something fun that we have done since we started the restoration 3 years ago, is a wallpaper/paint scrap book. We have uncovered so many layers that date back well into the mid-19th century and beyond, many of these saw the Civil War. We have saved a piece of every one regardless of era, and have started a book telling which room they have come from and our best estimate of age.